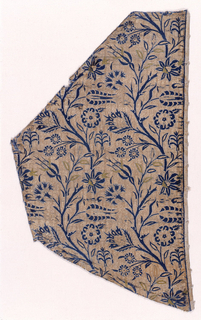 A ground of gold twill (metal very worn), with serpentine branches bearing carnation and lily blossoms primarily in blue, outlined with supplementary white weft. Other details of the design are worked in supplementary orange and green wefts (badly faded). Right selvedge present.